The Wespe is a German tier 3 self-propelled gun. 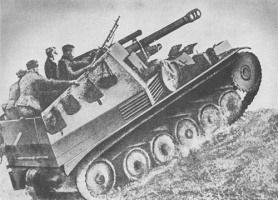 Self-propelled gun on the basis of the outdated Pz.Kpfw. II. 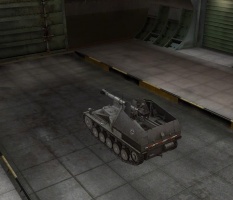 The vehicle was designed as a mobile artillery unit for armored forces. The armored cabin with the modified 105 mm field howitzer was mounted on the middle and rear parts of the chassis. This SPG was a successful re-use of the outdated chassis. A total of 700 vehicles were built from 1943 through 1944. It is an excellent SPG for its tier. 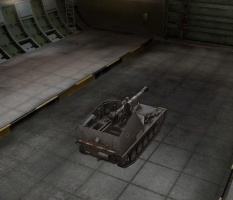 It is somewhat accurate and has a good gun with a fast rate of fire for an SPG. 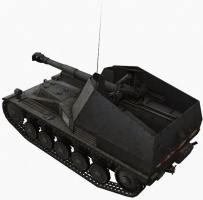 It can use armor piercing shells on its second gun, which makes it impossible to counter-arty, although whether people will be trying to counter-battery a tier 3 is questionable; very few players have the skill and patience to do this at such a low tier. Its traverse speed is slow, and the engine has low horsepower, so it requires good positioning at the beginning of the round; it takes time to change position. Later SPGs are significantly faster. The Wespe leads to the Pz.Sfl. IVb. 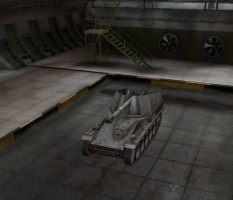 Far superior to the Sturmpanzer I Bison, the Wespe is the German tier 3 artillery of choice. Although similar to the M7 Priest and the Lorraine39 L AM (the damage and penetration are identical), the Wespe distinguishes itself with the ability to fire AP rounds. This isn't a distinctive advantage, but it varies things up a bit. Be aware, however, that the AP rounds and the HE rounds have roughly the same penetration and damage - and unfortunately, AP rounds can bounce and ricochet, whereas HE rounds can't, making the AP rounds fairly useless. Additionally, one can use HEAT rounds for the same purpose as AP rounds while also having double the penetration. The engines and FuG Spr. 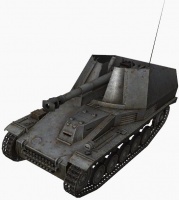 1 radio carry over from the PzKpfw II, so install the Maybach HL 62 TRM engine and the radio immediately. If you don't have the radio, research and buy it immediately, since the stock radio has a very small range. Research the suspension first for improved traverse speed. Next, research the second gun. In the early 1942, the Panzerkampfwagen II (Sd.Kfz.121) light tank was withdrawn from frontline Panzer units and relocated to second line duties after being in service since 1936. That step provided the opportunity to use its reliable chassis and components for conversions such as the Marder II tank destroyer and Wespe. Alkett designed the Wespe in mid 1942, and its practical design was chosen over other designs based upon the Panzerkampfwagen III or Panzerkampfwagen IV’s chassis. Wespe (Wasp) was a light self-propelled gun armed with a 105mm light field-howitzer and based on the unmodified and modified Panzerkampfwagen II Ausf F chassis. 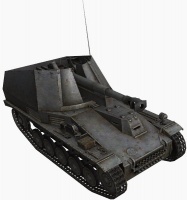 Wespe received the designation Sd.Kfz.124, but was also known as the 10.5cm le FH18/2 Fahrgestell auf Geschützwagen PzKpfw II and as the Leichte Feldhaubitze 18/2 auf Fahrgestell PzKpfw II (Sf). The main idea behind the design of Wespe was to provide all mobile formations with proper and indirect artillery support. Wespes were to operate behind the frontlines and were not to engage enemy vehicles, however, they carried armor-piercing ammunition in case of an encounter. Like artillery, the Wespe operated in batteries and received orders and directions from forward observers by radio or field telephone: reducing the risk of being exposed to direct enemy fire. The Wespe was based on the regular Panzerkampfwagen II Ausf F light tank chassis and on modified Panzerkampfwagen II Ausf F chassis'. Both versions used many standard components of the Panzerkampfwagen II Ausf F light tank. Ausf F was the last variant of Panzerkampfwagen II to enter full-scale production. Ausf F was produced by FAMO of Breslau (Wroclaw) and some 1400 chassis were manufactured, while 524 were completed as tanks from 1941 to 1943. 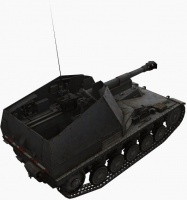 This model featured increased armor protection and other modifications based on battle experience. 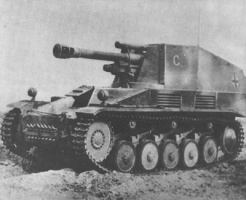 The early version of the Wespe was based on a regular tank chassis with engine moved forward (to a more central location) and the suspension reinforced in order to absorb the stress from firing-recoil. The later version was based on a modified chassis with a slightly lengthened (by 220mm) hull, engine and radiators moved forward (to more central location), and the suspension reinforced to absorb the stress from firing-recoil. The longer hull resulted in an increase in the space between the last road-wheel and idler. Modified chassis' were known as Geschützwagen II - Gun Vehicle / Gun Carriage IIs. The configuration of the driver compartment was changed during production, creating two variants as well. This page was last modified on 19 July 2018, at 17:29. This page has been accessed 220,136 times.